Marketing in Motion Pictures Daisy Norwood-Kelly '18 worked in marketing research for Paramount Pictures over the summer. I interned at Paramount Pictures. I was lucky enough to receive a scholarship set aside for Strategic Communication majors which helped pay for housing while I was living in Los Angeles. During my time at Paramount, I worked with their Market Research department to get more granular insights into audiences through surveys and screenings – what ideas/characters/stories they like, what they don’t like, what they want to see more or less of. This information shapes the marketing strategy and can even ultimately change the movie itself. For the last month, I worked on a millennial moviegoers survey to provide insight into what millennials want to see and what we can do to get them into the theaters. It’s been a mostly independent project, and not without a few hiccups along the way, but it has been extremely interesting to see how their perceptions, tastes and preferences alter how they make decisions about movies. During my time at Paramount, they organized a number of intern alumni panels (people who interned at Paramount and then went on to do cool stuff) for us to attend. One alum, Eric Fleishmann, told us how he had left Paramount and scraped and dreamed until, at the age of 27, he had his own film financing company and was killing it! It just reminded me that only really talented, creative and brave people get this internship (100 out of 10,000 applicants) and I can be just as successful as any of those who have come before me. I think the hardest challenge was when I became the team leader for our Intern Project. Each summer, interns are split up into groups to create something for Paramount. This summer, we had to make a three-minute short video about our experiences. When I was elected team leader, I was secretly nervous. My experiences as a leader have either been fairly laissez faire or wild dictator, and I did not want to repeat those. I have been challenged to keep calm, cool and collected under pressure, make sure everyone has their voice heard and ensure our project is the best that it can be. From the positive feedback I’ve received from my team and the quality of our project so far, I believe that I’ve risen to the occasion and impressed myself. I’m a movie buff, so when I accepted an internship at Paramount, I thought it might be like getting to see how the sausage is made. Despite everything I’ve seen and done during my internship, it has only reaffirmed my love of movies to bring people together and to push the envelope culturally and technologically. Since working at Paramount, I’ve realized that I am capable of a lot more in the marketing field than strictly creative. I also have the power to be analytical and decisive about what kind of creative campaigns will work best in the current market. I never thought that market research was going to interest me in the way that it has, and I see a lot of area for growth in this field. While it hasn’t thrown my career path totally off-course, I will say that it’s added another road to explore. 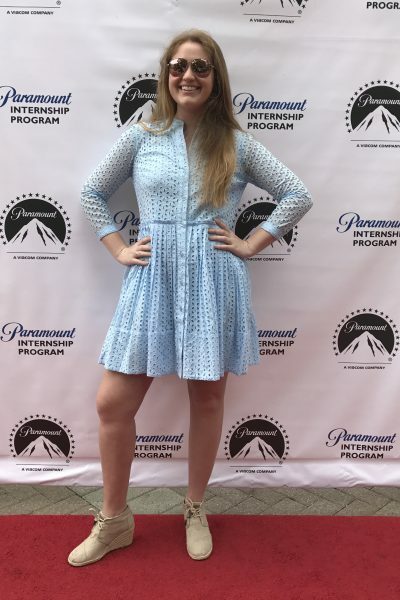 W&L was a huge help in getting this internship, especially because I reached out to a WLU alum who worked at Paramount to learn more about the industry so I was more prepared when it came to applying. Mostly, W&L has given me the confidence to work in a challenging environment. One cool achievement of my internship this summer has been winning the Paramount Intern Video Project contest with some of my colleagues. The project was to create a three-minute video about our experiences working at Paramount. It was a pretty loose assignment and we ran with it! You can watch our video, “Mission INTERNpossible,” here.